If your order is a gift, why not let us gift wrap it for you? 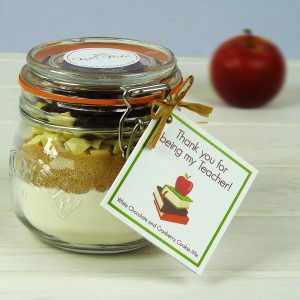 Why not say a big thank you to your child’s Teacher with our Thank You Teacher Chocolate Spotty Dotty Cookie Mix Jar. 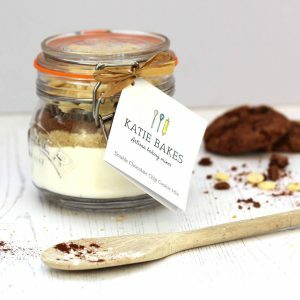 Our Artisan baking mixes are beautifully packaged in authentic Kilners® jars with a fun themed label. 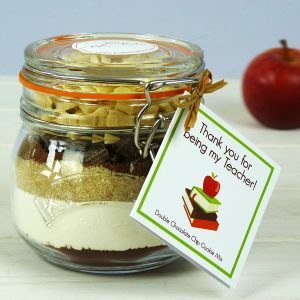 A perfect end of year gift for your Child’s Teachers or at any time. All of our foolproof baking mixes just require the addition of softened butter and eggs to make delicious treats. All our mixes are made with the finest quality ingredients including English flour and contain no artificial colours or flavourings. If sending as a gift, the jar can be gift wrapped and tied with ribbon with a gift tag containing your message. 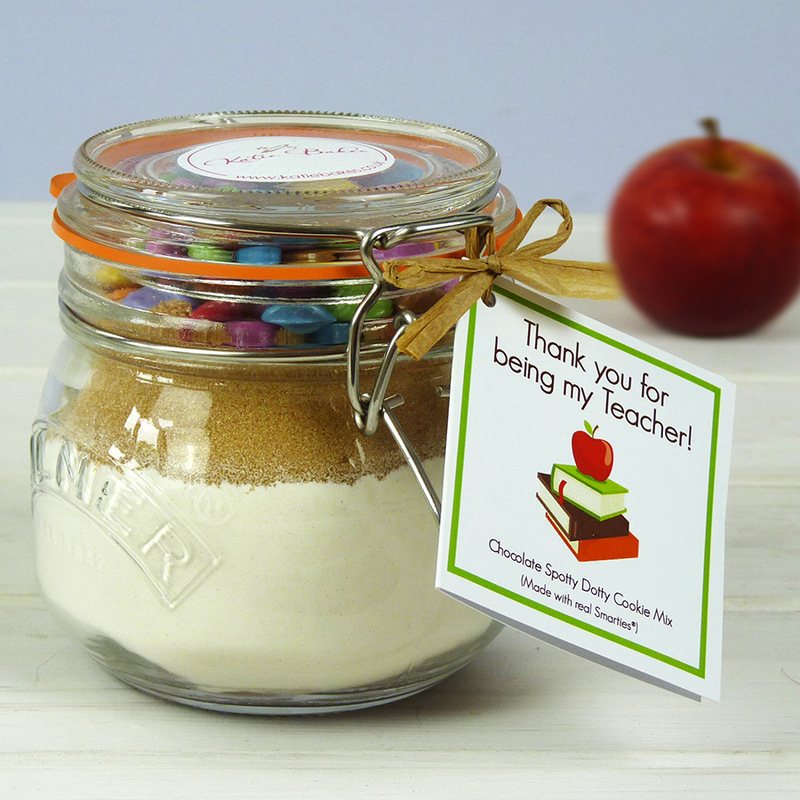 Gift tags with a gift message can also be ordered with your jar at no additional cost. Alternatively we have red gift bags available which are the perfect size to fit the jar. Unfortunately we cannot post the jars in the bags. The mix is contained within a 0.5 l authentic glass Kilner jar. Ingredients: Wheat flour (wheat, raising agents – Mono Calcium Phosphate and Sodium Carbonate. Calcium, Niacin, Iron, Thiamin), Brown Sugar (sugar and cane molasses), Smarties® (Sugar, Cocoa Butter, Skimmed Milk Powder, Cocoa Mass, Wheat Flour, Lactose and Proteins from Whey (from Milk), Butterfat (from Milk), Rice Starch, Emulsifier (Sunflower Lecithin), Fruit and Vegetable Concentrates (Safflower, Radish, Black Carrot, Lemon, Hibiscus), Spirulina Concentrate, Orange Oil, Glazing Agents (Carnauba Wax, Beeswax White), Natural Vanilla Flavouring, Invert Sugar Syrup), cocoa powder. None of our mixes contain nuts however they are produced in an environment which handles nuts.